Those who want beautiful flowers may want to use the best fertilizer for plants and flowers. If you don’t know what to search for or how to identify such a product, we have a short guide as well as a selection of such nutrients. 1 What must a fertilizer contain? 2 Why are there more types? 3 Are there any risks? 4 Is there an absolute best such product? What must a fertilizer contain? To properly feed the plants and help them develop, a fertilizer should contain Nitrogen, Phosphorus and Potassium. These substances promote foliage, root and flower (or fruit) formation, respectively. The catch is that if you want beautiful flowers, the solution should contain more Phosphorus. Additionally, the bottle won’t only contain these 3 components, but the highest concentration is of 10% of each when compared to the whole quantity. Why are there more types? Visiting the garden center, you’ll notice several types of plant food: foliar, organic liquid, solid, and others. Each of these types address a different need and preference. They also have a different concentration, when it comes to the substances they provide to the plants. Some of them are specially formulated for specific types of plants, for not all of them need the same amount of substances. Fertilizers are usually applied at the root of the plant, however sometimes you might need to use a foliar fertilizer. This one gets sprayed on the plants’ leaves, but it’s not always enough and not all plants like it. The foliar flower fertilizer quickly addresses a potassium deficiency. Chemical fertilizers are good for ornamental plants and bushes. Based on how they were obtained, there are chemical and organic fertilizers as well. You might want to choose a natural product if you need to use it on edible plants. Even on non-edible plants, the organic one might be a better choice because they have more benefits than any other type of plant food. For instance, there’s no risk of burning the plant, and beneficial insects will thrive as well. A major difference between the organic and the chemical fertilizers is the release time. The former is a slow nutrient releaser while the later releases the nutrients faster. The organic one might be best used outdoors though indoor application is also possible. Just like with any other product, there are risks involved with all fertilizers. The organic ones might smell appetizing to your pets, despite it smelling bad to you. The chemical fertilizers when applied in a high quantity or concentration can burn the plant instead. Is there an absolute best such product? Most likely the best product is the one created specifically for the type of plants you have. Buying specific blooming fertilizers for each flower or shrubs could be too expensive, and if money is not something you can spare, an all purpose one will do the job just fine. An organic one might be a good option of you are forgetful as you don’t need to use it as often as the chemical one. We talked enough about the things to look for when choosing a fertilizer, so let’s see the ones that are currently the most popular on the market. If you never used a fertilizer before you could try out the one from 13Essentials as it’s a generic one. This means you can use it on all types of plants, regardless of the pots being indoors or outdoors, and on vegetables. The bottle here contains 1 fl oz of product that can be turned into 6 gallons of nutritious water for your plants. Some folks discovered they needed to add more fertilizer to each gallon of water for the desired effect. Green Earth Agriculture suggests a fertilizer for flowers planted outside. The bottle contains 12 fl oz of organic substance that can cover a wide variety of plants, including annuals and grass. It should be mixed with water, to obtain 24 gallons of fertilizer. Unlike other similar products, this one contains the lowest levels of harmful chemicals such as arsenic, mercury or lead. The results will appear in less than a week from first application. If you have a big garden to take care of, perhaps 1 gallon of fertilizer will be of great help. 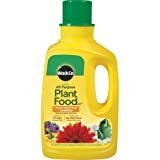 The product is specially designed for flowers and blooms, and super concentrated as it can make up to 256 gallons of actual product to feed plants with. It’s safe to use it with a variety of garden sprayers too. Some people have many different types of plants in their homes or gardens, and it’s difficult to keep many products specially formulated for each. The all purpose plant food created by Miracle-GRO is therefore a great solution for this situation. 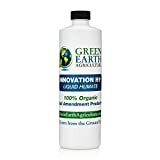 The product comes in a big bottle of 32 fl oz and is suitable for vegetables and trees as well. Despite getting a large quantity, you still have to dilute it before use. 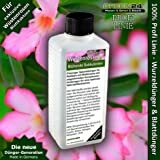 This liquid fertilizer for flowering plants was specially created for the desert rose, also called Adenium. There are 2 ways of application: directly at the roots or as a foliar. If you also use pesticides on your plants, rest assured that this solution can safely be mixed with many different pesticides. One has to use this solution with care and diluted in water because it’s very potent and it could kill the Adenium instead of helping it. By now you should be equipped with the right knowledge on how to choose the best food for flowers as well as knowing a few reliable brand names. It is our hope your plants will thrive from now on!